Really, there are no words I could possibly add that would be adequate enough to do justice to these latest horrors. I just need you to silently bear witness and offer pity. Also, two side notes: 1) Concept2 – I see this as a personal betrayal since my thighs are on fire today. As soon as I can stand again I’ll… well, I’ll walk more quickly and stand without making small whimpering noises – like the champ I am! Those aren’t tears. I just have allergies, and 2) the gym only looks empty – there are actually people behind me – all ducking their heads down trying not to catch the eyes of these beasts lest they, too get drawn into the event horizon of rope pulley ski hell (or I may have carefully avoided violating anyone’s privacy as the gym got busy) Oh, and in case you don’t think my trainer is pure evil, I will leave you with this – a gift she once sent to me. PLAY IT! Know my eternal suffering! … and I rock at soccer! You’re welcome! I guess I’ll go back tomorrow for more. 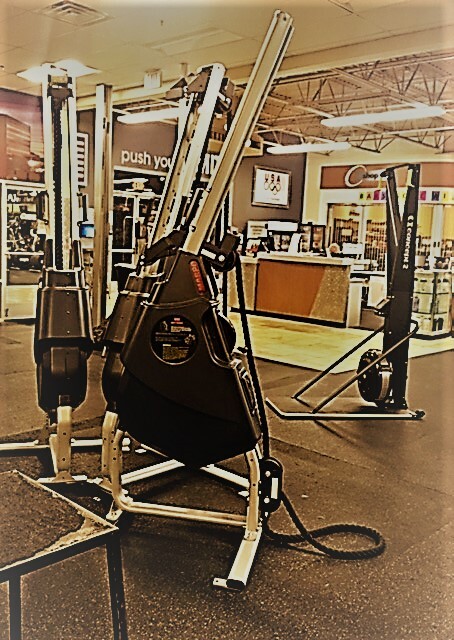 A few weeks back, a certain mouse suggested a blog post based off a comment about the gym. I’m going to run with that idea, since there’s only so much I can tell you about my photo appearing in the local online paper’s “A List” (it’s all about timing and a Santa hat) or going to see Postmodern Jukebox (YouTube video below). Anyway, back to the story about the gym. Since I started actively going to the gym in August, I’ve learned that my trainer and I have very different understandings when it comes to the definitions of words. I personally blame her Midwestern upbringing – maybe the harsher conditions or plain living affected her brain adversely. Who knows? Granted, I realize that people outside of Texas may find this statement ironic or even scoff at the idea that Texans can actually get anything right (insert a few political jokes here), but I contend based on my limited interaction with this delightful Missouri native, that I have a better understanding of words – at least when it comes to adjectives. On any given weekday I arrive at training dressed in my gym finery with my hair pulled back, holding my water bottle (lest I be stuck drinking spit as she’s suggested before), and exuding my pluckiest, “it’s 5:30am!!!! !” attitude, which may look like I’ve been hit in the face with a door repeatedly, but it’s an exceptionally plucky door. On a couple of those days, I meet up with my trainer Jenn who always declares, “you’re going to LOVE what we’re doing today; it’s going to be so much FUN!” She somehow manages to deliver this news with a straight face every time. Clearly, she’s not a person to be trifled with should a poker game break out (as you know they often can do in the middle of a gym). This is usually where I tell Jenn, as she’s doing a little dance, because “fun” and “love” somehow also involve an impromptu dance or song, that I don’t think she understands the meanings of the words she’s using. See, her idea of “fun” and “love” usually involve me temporarily losing my ability to move easily out of chairs for a day. On days where things are “super fun”, I lose that same ability to move easily for multiple days – maybe even a weekend. Pitiful noises including tiny gasps and whimpering echo quietly through the office or house. I dread “super fun” days. Thankfully, those days occur less often. In fact, I haven’t had a true “super fun” day in months. I don’t tell Jenn this in the event she gets worried we’re not having as much “fun” as we could. Just recently a new word, “chipper,” was added to her twisted vocabulary. I wish she’d waited until she was a little more clear on “fun” and “love” before jumping into a brand new word, but what can you do? “Chipper” is very similar to those other words in that its definition is the exact opposite of what a normal person would expect. You see, upon exploring the topic of a “chipper,” which is used as a noun of all things, I’ve learned you definitely won’t be anything close to “chipper” (the adjective) upon its completion. Instead, you can expect to be sweaty, exhausted, or even a little unsteady, but likely not chipper as what once passed as muscle becomes rubber, and you contemplate how long one can lay on the mat breathing heavily before others become alarmed. “Chipper,” in her crazy upside down world, describes a series of events designed to make you cry. I think “they” (the gym “man”) uses it as a way to lure you in – a good old fashioned “bait and switch” technique. “Here Beth, we’re going to do something “fun”, you’re going to “love” it, it’s called a “chipper.”” A sentence that roughly translates to, “you will probably hate your life, but thanks to your early onset senility you’ll likely do this again and again, because hey we’ve called it a “chipper””. I then took my “awesome” self back to the locker room ending another “awesome” moment at the gym. Of course, tomorrow I’ll be back at it for more “fun,” more things I “love,” and ready for another day where I “chipper” my heart out even though the meanings of these words are a bit mixed up. And now for some Postmodern Jukebox – a GREAT show! Thanks to Ben for introducing me to them and April for going with me as part of my birthday month silliness. When I started this blog some 9 years ago (good grief) the main goal was to practice writing. If I could somehow amuse my family and friends then that was a bonus. If I could force them to continue to read without amusing them (as I’ve managed to do), then that was like a super double bonus plus! Go loyalty! The focus or theme or what have you was to write-up anecdotes using the style I’ve always used – the “style” (I really feel that needs some air-quotes) being how I tend to write letters (now emails) to friends. I’m all over the place – like this paragraph. They never minded that bit, seemed to encourage it at times, “you write like you speak,” and thus you suffer. Shake your head at them. I’ve been waiting for a good anecdote to share, but unfortunately an interesting one hasn’t really risen up. I suspect it’s because I travel in the wrong circles. That’s right friends, I’m calling you out – you and your clear lack of “right” circle-ness. There’s a geometry joke in there. Ok, sure there was the one guy at the Humane Society last week. His fit-pitching was fairly epic as I waited patiently(ish) to ask about a fluffy sole who was clearly calling to me behind the glass, but again not much of a story since I walked out without being helped. His fit had reached a new exciting blend of frustration and confusion over some fairly simple rules. (For the record, Humane Society rules are just not that hard, guy! You don’t have a permanent place for a cat. One day you will, but that’s not today.) I also managed to smash a joint on my thumb on the same day. I keep insisting it’s purple and at least five times bigger than it was earlier in the day only to be asked by these so-called friends while comparing the thumbs side-by-side, “which thumb is it?” Uh, the big purple one! (It’s purple on the inside?) It still smarts – probably nerve damage. It will likely have to be removed. Sadly, it happens to be the thumb I hit the space bar with. Soon my writing will be devoid of spaces. Iapologizeinadvance. So, in light of this writing lull and to keep practicing (because after 9 years there hasn’t been any noticeable progress) I’ve resolved to write an autobiography of sorts. I know, right? Some of history’s most famous and infamous people have them and now we can add famous, infamous and Beth. It’s a literary milestone. I’ll start off slow. I don’t want to completely overwhelm you with the life and times of the lower middle-class all at once – the adventures of a monolingual speaker who has barely escaped the borders of their state much less the country. Hey, there was that time I went to Canada. Boy, talk about culture shock! Loonies and toonies – where do they come up with that stuff? They claim this is a photo of me, but really it could be anyone. Parents, just because you wrote my name on the back doesn’t prove anything. I’m watching you! I was born. At least that’s what I’ve been told, and as proof I’ve been presented various papers and a book with a few photos documenting the event. It’s all rather convenient and a bit suspicious if you ask me. Some of the photos show these youthful kidults who I can confirm did grow up to be my parents. They look a bit tired in the earlier pictures. I’m told they remained that way for approximately 18 years and then something inexplicable happened that made them look and feel lighter. I’ve never been able to identify precisely what changed, but it must have been fairly important. Although, I admit I’ve seen the weight return over the years, which oddly corresponded with some big things in my life. Must be some sort of weird symbiotic thing. Both of my parents were from Dallas. Mom from Highland Park and Dad from South Oak Cliff. If you’re familiar with Dallas, you understand the significance. If you’re not, then to sum it up – Mom was born on the right side of the tracks (in fact those tracks aren’t even Dallas tracks, they’re tracks in their own city within Dallas) and Dad was born on the very wrong side of the tracks. I later learned that many of Dad’s (and his family’s) numerous shortcomings had to do with his tracks (those shortcomings multiplied x10 each year post their divorce). I learned from Dad that people from the right side of the tracks (aka “your mother”) tended to marinate Spam in a lovely Dr. Pepper based sauce. Dad wasn’t particularly good at lobbing insults. I’m not really sure what initially drew them together. Mom would say she thought Dad was smart, but was proven wrong; he was only social climbing – tricked her by claiming to read books. Clever guy! Dad said something along the lines of Mom was really nice and fun. Bless his heart. Quick disclaimer to stop any gasping: I absolutely would tease my parents in this way. In fact, I’m teasing Dad now. Dad, you’re welcome! To post a retort, I guess you’ll need to work on that new blog of yours. Now you have incentive. You’re welcome, part two. Next up, the trailer park! (In other words, I’m cutting this short and giving you a small reprieve. There’s only so much “me” one should be forced to sit through in one day.) And I’ll leave you with a little Julie Andrews, because I stupidly got this song stuck in my head where it is now firmly lodged. I only have myself to blame. During my summer vacation, which sounds more like a three month holiday away from school rather than a few days out of town, we decided to a make stop. 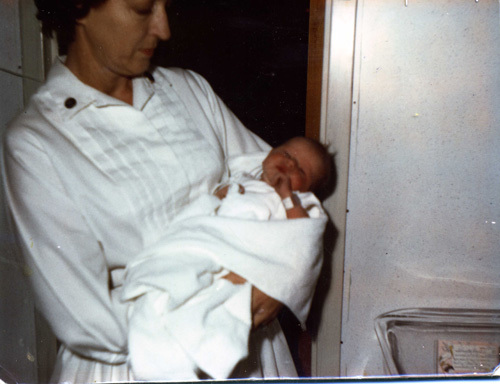 Truth be told, we made several along the way to New Orleans, because one of the more awesome traits I inherited from my mother (that did not include her looks, her unblemished skin, her fine features nor her athletic ability) was her bladder, which is exactly the size of a walnut. We see the sign on the way to Houston for a place called Buc-ee’s. Now I’ve never heard of this place and all I see is a gigantic, happy squirrel head on a sign accompanied by some bad puns. Oh sure, it’s a beaver to the rest of you, but my brain wouldn’t let the whole squirrel thing go and try as I might to get it right, it stuck in my head that we were going to Squirrely’s. April assumed I had to be familiar with Squirrely’s since it was a Texas thing. It may be a Texas thing, but it’s never been on my Texas radar. You see my car only drives two ways – one is on IH35 north of Austin, the other is northeast to Nacogdoches. Now before you think I’m a complete big box convenience store newbie, I had actually heard of and even been to both Love’s and Stuckey’s. I’ve even been to Robertson’s in Salado on a number of occasions, but never a Squirrely’s. Never heard of it. So, it’s basically not my Texas, it’s someone else’s Texas. We pull up and Squirrely’s is just huge. I’ve never seen a Stuckey’s or a Love’s quite so large – it might compare to a mini Wal-mart (there is actually such a thing). We go in and like the Tardis, it’s bigger on the inside and offers an assortment of everything. It’s the kind of store where you become a little concerned you’ve stepped into a Grimm’s fairy tale and feel the need to worry that if you grab too much of whatever some cantankerous, hoarder hermitess (I cannot believe that word made it through spell check – who knew it was real) will grab you up then pop you into a special people cooking oven. My only comfort was the knowledge that I would avoid the oven, because well I’d like to see a hermitess try – I border on ”immovable object” – a good thing when facing down fairy tale cannibals. Solid planning on my part! In the store is a wall of candy (you see the analogy here, right? ), fresh fruits, snacks that involve cheese (ok, that’s my love of cheese shining through), sodas with special crunchy ice, computer stations to order fast food (I guess you can’t just walk up to a person an order), clothes, knick-knacks, do-dads, toys and 100 super clean bathrooms. I took pictures and I walked out with a Squirrely puppet. Of course I did. I decided this little squirrel would have be included in the vacation. Being mid puppet show, it was obvious that this pairing of girl and squirrel were meant to be. A friend of mine sent me a text post purchase, after I shared a photo of the Squirelly and me, basically asking, “how is it you’re more ridiculous than I am?” Oh young Jedi, it takes focus and dedication – years of being a ridiculous human, but I’m straying off topic. 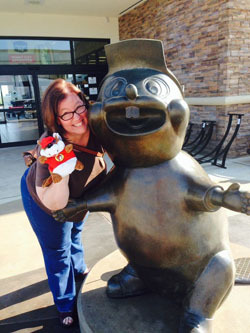 I start posting these ridiculous photos with this ridiculous squirrel (yeah, yeah, yeah beaver) and I discover there’s this whole crazy convenience store cult lurking among my Facebook friends that simply adore Buc-ee’s. PIcture the martians in Toy Story and “the claw”. You could hear them all say the words in unison, “the Buc-ee’s” or 100 Homers saying “donuts”. You get the idea. It was a bit eerie. I was genuinely blown away by the envy pouring my way. Some were excited for me – hooray, she’s finally arrived at this consumer’s paradise. It was as if I had been transported to whatever place you find to be the most magical and it made my friend’s happy. Mine involves ornate outfits – the bigger the skirt the better, a gigantic library, and a lovely stroll-worthy garden. Oh, and access to all of our modern conveniences, because let’s face it if we go back in time people were rather stinky with bad teeth. Plus, in this fantasy world I have pets and pets need good vets and also I’d like a recycling program in place – very important. Oh, and cheese. Did I mention I’m a huge fan? Right, that’s my place – theirs was Buc-ee’s. You would have thought, based on the ecstasy that followed the announcement that I’d been to the store and as the doors swished open angels began to sing. It was crazy. Now, I don’t mean to put down Buc-ee’s. It’s a great place to stop. It’s clean, the bathrooms are great, the ice is cheap, there are a ton of gas pumps, but it is a convenience store – a very large convenience store. I do admit that on the way back home we did made another stop there (my request), because I just had to. I drank that Kool-aid. When we did stop in again, a person dressed as Buc-ee (a happy gigantic squirrel if you’re me) was strolling the store. You could have your picture taken with him. I did do this. It was hysterical. You will never see that photo, but know that Buc-ee hugged me.